Archbishop Vincent Concessao has said a Catholic country like Switzerland should not allow stashing of illegal money in its banks and that Europe, “bankrupt on moral values”, was in need of re-evangelization. In an interview to Catholic News Agency, he said the issue of the re-Christianizing Europe emerged during discussions with the Pontifical Council for Justice and Peace about the amount of private Indian wealth deposited in Swiss bank accounts to avoid paying taxes in India. 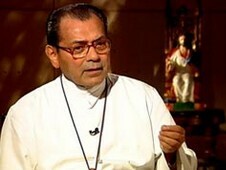 He said it is time for Indian Catholics to further help re-evangelize Europe. “We are very much concerned because it was missionaries from Europe that brought the good news to continents like Asia and Africa. “While the Holy Father keeps on harping about the value of life, on morality, on dignity, and human rights, this is not necessarily reflected in terms of the behavior of the people in Europe,” he said. Hence, the increasing need, the prelate said, for Indian Catholics is to help re-evangelize the continent which helped to bring Christianity to India. His predecessors as archbishop have included men from Wales and Ireland. “There are already missionaries from India – priests and religious – working and offering pastoral services” in Europe, he explained. While Catholicism accounts for less than 2 percent of India’s population, that figure still constitutes over 17 million Catholics, a number that is more than three times the amount of Catholics in the United Kingdom. Archbishop Concessao said their ad limina visit to Rome was a real reminder of the missionary nature of the universal Church. Bombay Laity Ezekiel’s Chapter 3 Task as Watchman 17 “Son of man, I have made you a watchman for the people of Israel; so hear the word I speak and give them warning from me. 18 When I say to a wicked person, ‘You will surely die,’ and you do not warn them or speak out to dissuade them from their evil ways in order to save their life, that wicked person will die for[b] their sin, and I will hold you accountable for their blood. 19 But if you do warn the wicked person and they do not turn from their wickedness or from their evil ways, they will die for their sin; but you will have saved yourself. This entry was posted in Church Worldwide news. Bookmark the permalink. I hope Archbishop Vincent is aware that we need to clean up the muck and dirt on our backs first. There is so much of alleged financial scams,property related issues and assets issues where the Church in India need to clean up. Why go for Switzerland when we have tonnes of muck to clean up here in India. ?